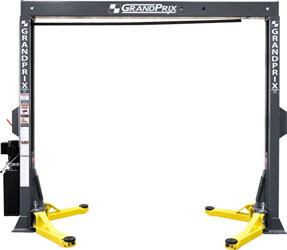 BendPak XPR-10S-168 Clearfloor Dual-Width Extra-Tall Two Post Car Lift 10,000 lb. To view the lift inspection guide Click Here. The BendPak XPR-10S-168 future-proofs your business. Get the same exceptional direct-drive lifting performance and clearfloor convenience as with the standard XPR-10S but with an added 23” up top. Make sure your business can specialize in taller, “Sprinter” delivery, service and transportation vehicles before it’s too late. The BendPak XPR-10S-168 is the super-industrial-strength piece of equipment that has it all: leading-edge technology, top of the line materials, design that’s way ahead of its time and a 5-ton lifting capacity. Fits in shops with ceilings higher than 14’. The XPR-10S-168 features double-telescoping screw pads with gouge and tear-resistant polyurethane pads to help increase workplace safety and reduce operating costs. A set of our 63 mm stacking adapters included as standard accessories. Our newest line of XPR-Series 2-Post lifts offers a wide selection of durable, safe and reliable systems for virtually every lifting application. Powerful and secure, BendPak’s XPR-10S-168 in particular has an incredibly rapid lift speed and a robust menu of features to increase efficiency and productivity, but with fewer serviceable parts and reduced necessary maintenance. The results are lower operating expenses and higher productivity. If you’re looking to make more money in less time than ever before, you’ll find that the new XPR-10S-168 lift is the perfect addition to your shop. Tall, narrow fleet vans have been the rage in Europe for more than a decade and are just now becoming popular in the United States. Universally referred to as “Sprinters,” these aerodynamic and fuel-efficient vehicles captured 3.5% of the full-size van market in 2005. Four short years later, that number rose to almost 18%. Now, some estimates suggest it will reach as high as 23% before the end of the decade. Companies like FedEx, DHL and Microsoft already employ Sprinters for delivery and transportation services. Don’t they sound like the kinds of clients you’d like to have? Here at BendPak, we believe the best way to get ahead is by thinking ahead. That’s why we’ve redesigned most of our two-post lifts to accept taller vehicles like the Sprinter. All of the extended height models in our XPR-Series can easily lift some of your largest full-sized pickups and commercial vehicles (including Sprinters), yet still provide specific capability for sport and compact cars, both foreign and domestic. The XPR-10S-168 is a rugged, close-top model lift with a 10,000-lb. maximum lifting capacity. Sound complicated to operate? Don’t worry. When it comes to ease of use, our dual-synchro equalization system and user-friendly controls are the stuff of legends. All of BendPak’s extended height, clearfloor model lifts feature dual “direct-drive” low-pressure cylinders that minimize leakage and reduce the workload placed on the entire hydraulic system. This exclusive BendPak design feature saves you maintenance costs throughout the life of your lift—you aren’t going to find friendly sensibility like this anywhere else. Some more BendPak XPR-Series exclusives include: 16 individual maintenance-free UHMW load bearings, single-piece columns, extra-tall lifting carriages and oversize 5” cable sheaves. And, to better cater to your specific lifting needs, we offer similar model lifts with optional specialty arm configurations. Bottom line—when you buy BendPak, you can expect a significant boost in performance and life expectancy. In fact, your BendPak XPR-10S-168 might be the last lift you ever purchase. No one surpasses us in quality and safety. Not now, not ever. When you get a BendPak, you get more than just a fantastic lift. You get peace of mind. That’s the BendPak benefit. 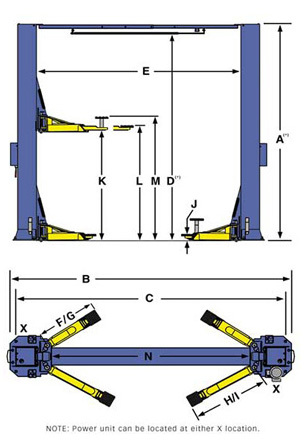 Increased overall arm positioning for lifting a variety of different wheel base vehicles. Overall arm sweep and minimum arm reach are also extended to precisely lift vehicles that have unibody construction, OEM recommended pick-up points and wide and / or narrow wheelbase configurations. Wide or narrow designs are available, allowing you to maximize your floor space. The XPR-10-168 is the narrow version of our extended height clearfloor XPR-Series lift line. B - Width overall (WIDE CONFIG) 145" / 3,683 mm"
* CE Approved and Certified. Meets or exceeds the standards prescribed by European Standard EN 1493. 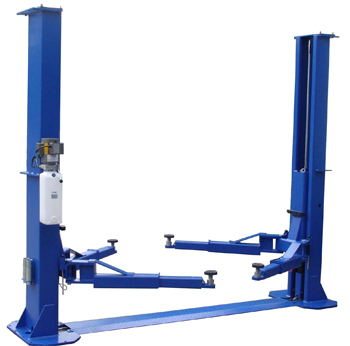 Not all BendPak lift models meet the standards as prescribed by ANSI/ALI ALCTV (Current Edition) or ANSI/UL 201. Consult www.autolift.org for a complete list. *Note The manufacture does not recommend the use of the standard pads to raise trucks & vans & any other frame-style vehicles. It is recommended to use the optional truck kit to raise these types of vehicles.